The Economic Management Team would meeting state governors today to harmonise positions on the ongoing negotiation with labour unions over new national minimum wage. Daily Trust reports that the labour unions have threatened to embark on nationwide strike on November 6, 2018 if the Federal Government fails to meet its demand on the new National Minimum Wage of N30,000 which, according to them, was agreed upon. The government had since denied that any agreement was reached on N30,000 as minimum wage. Minister of Labour and Employment, Dr Chris Ngige, said while the labour agreed on N30,000, the private sector, the federal government and state governments proposed N25,000, N24,000 and N20,000 respectively. On Friday, October 26, 2018, Ngige briefed President Muhammadu Buhari and Vice President Yemi Osinbajo on the strike threat by the labour unions over the delay in the implementation of the minimum wage. Ngige told State House correspondents after the closed door meetings at the Presidential Villa, that the Economic Management Team would be meeting with state governors to harmonise positions on the ongoing negotiation with labour unions. "On Monday the economic team will meet and the governors are supposed to come so that the federal government will brief them on what is on the ground. "And we will see what they will be able to put to us, because the government side is still three tiers, the federal, states and the local governments. The federal government is the leader. "So, we are inviting them to come so that we will listen to them again, tell them what we are doing and what we intend to do, because they even have members on that committee. "So, on Monday we will have a very useful discussion before the tripartite committee will come and submit its report." Daily Trust reports that the federal government had recently adopted the principle of 'no work no pay', which the minister said whenever workers are on strike, they are not entitled to salaries as long as the industrial action lasts. The position was however faulted by the labour, which said the government was trying to intimidate workers and cow them over the legal right. 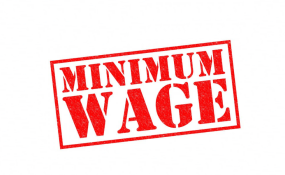 State governors had earlier said that though they are not opposed to the upward review of the N18,000 minimum wage, they are struggling to pay the current wage, adding that the ability of states to pay must be considered. Chairman of the Nigeria Governors' Forum, who is also the Governor of Zamfara State, Abdulaziz Yari, said, "The problem of the states is the capacity to pay what is agreed. As we are talking today, we are struggling with N18,000. Some of the states are paying 35 per cent, some 50 per cent and still some states have salary arrears.